A Treasure Trove of Siamese Cat Gifts! 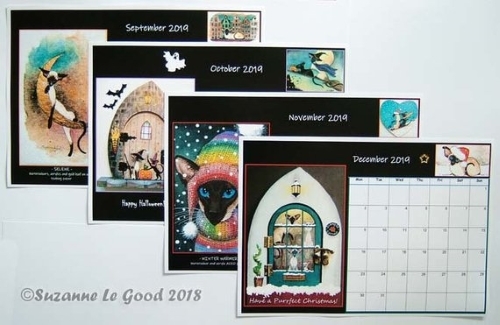 Our annual selection of Siamese cat gifts is a must for those who have Siamese cats in their lives. Siamese cat owners are a devoted (some might even say just a tiny bit obsessive) bunch, and I've found through observation of others and my own personal experience that we tend to surround ourselves and fill our homes with all kinds of reminders of our Siamese cats; arts, crafts, books, household items and other memorabilia - and that's in addition to our cats! So if there's a Siamese cat lover in your life, or if you yourself are that Siamese cat person, this page is for you. There are of course any number of Siamese-related goodies available on the internet; too many to list them all here. Below you'll find a range of items from inexpensive small gifts and stocking fillers to high-end art and collectibles - all totally things I'd buy for myself. 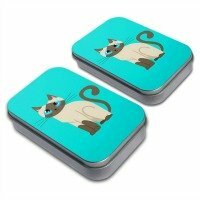 I've also included a few fun gifts for the Siamese cats in your life - because without them, where would we be? There are several sections below. To go to a particular section, use these links. Siamese cat gifts for Meezers! The products below are listed on either Amazon or Etsy. If you buy anything through the links, I receive a (very!) small commission, which helps to support the running costs of this website. There's no extra cost to you, but, if you prefer, you can of course go directly to these stores and search for the products yourself. 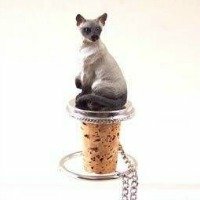 So here are a few small, and not-so-small, suggestions for Siamese cat gifts for younger Meezer lovers. In the same series as the ponytail holder above, this set of two trinket boxes are equally delightful and hold any number of small treasures. 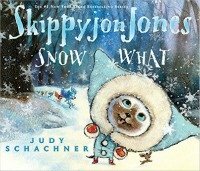 The latest in Judy Schachner's Skippyjon Jones series, Snow What re-tells the story of Snow White and the Seven Dwarves in Judy's inimitable fashion, with Skippy's chihuahua friends playing the Seven Dwarves! 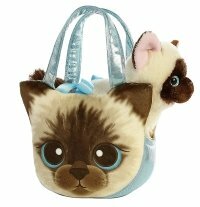 This beautifully designed pet carrier comes with its own removable plush Siamese kitten, secured by a satin ribbon. Aurora World has a great reputation for safety and durability so this one's bound to be a favorite for many years. From the inexpensive to the very expensive ... a range of gifts for the adult Siamese cat lover. For the wine-loving Siamese owner in your life, how about a wine-bottle stopper? I love these, although open wine bottles don't last very long in our house! 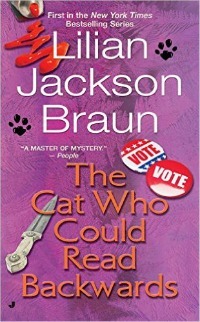 If you (or someone you know) enjoy Lilian Jackson Braun's detective stories featuring Jim Qwilleran, his Siamese cats Koko and Yum-Yum and an assorted cast of extraordinary characters, the whole series has been re-released both in paperback and now also on Kindle, which is exciting news. You'll find the complete list here. 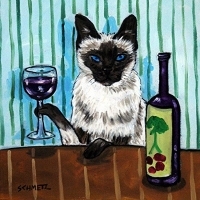 One of a series of animal-themed coasters, available individually, this handmade art tile is a delight for wine lovers! Measures 4.25" x 4.25" and backed with cork dots to protect surfaces. 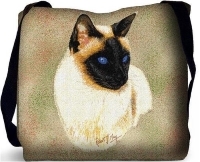 On a beige background and measuring 17" x 17", this beautiful tote bag with a lifelike Siamese cat on it was created by Robert May, one of the worlds leading feline artists. 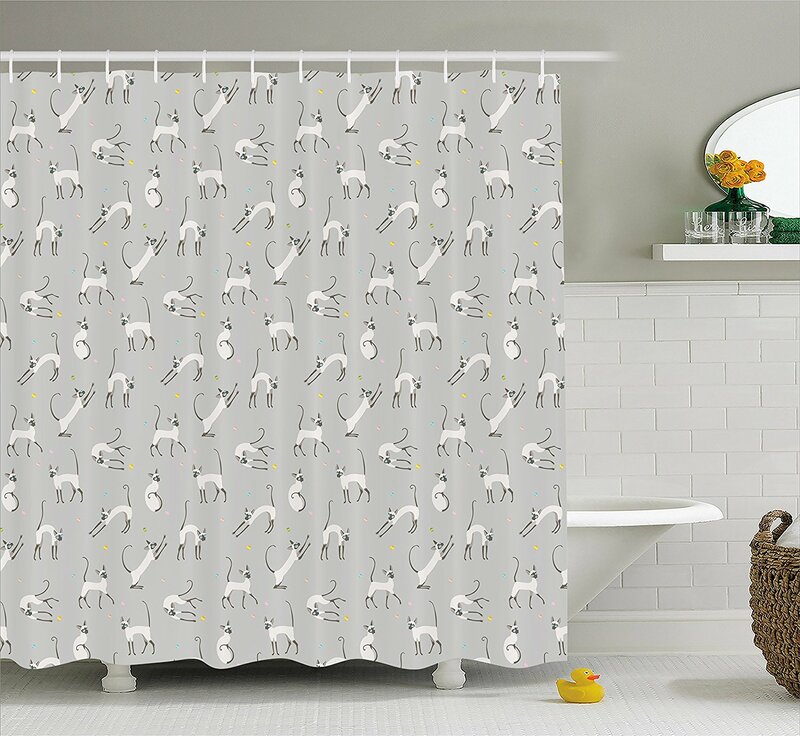 Brighten up your bathroom with this very cute Siamese cat shower curtain. Prancing, leaping, stretching, scratching ... all on a neutral gray background and available in three different lengths to suit all bathrooms. 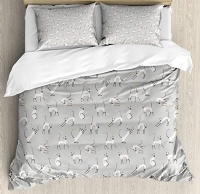 Similar to the shower curtain above, this duvet set consists of a flat sheet, comforter cover and two pillowcases, and comes in four sizes, including Queen and King. My Bandit never played much with toys, but here are three things he did love and always enjoyed, so if you're looking for a gift for the cat in your life, these come with a special 'Bandit Seal of Approval'. If you're here specifically looking for things to entertain a bored Meezer, you might also like to take a look at a newsletter I wrote, a while back, about toys. Bandit's No. 1 choice and his most favorite thing ever! 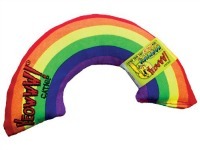 These catnip rainbows are well-made and sturdy, although even they don't last forever - probably why they also come in packs of three. 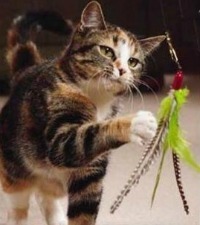 They last a good long time though, and the catnip is very potent. These feather 'Da Bird's are great too. Made from guinea feathers on a swivel, at the end of a three foot wand, they have a nice realistic bird effect. Cats love them so much they don't last long, particularly if you've got a 'chewy' cat, so it's worth buying the pack of three refills as well. This Christmas gift was a real hit with Bandit. As soon as we opened it he pounced! (It probably helped that a pack of dried catnip is included.) 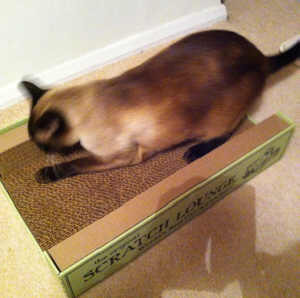 Well-made and sturdy with reversible surfaces, replacement scratch pads are also available.